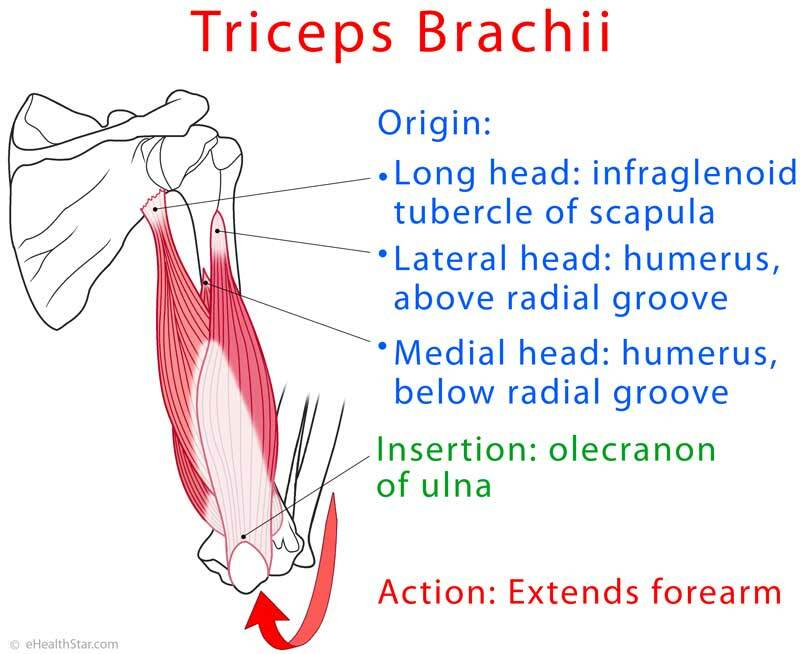 Triceps brachii muscle is located at the back of the upper arm. It extends from the top of the upper arm to the top of the ulna (the larger of the 2 forearm bones). The lateral and medial head extend the forearm (backward) in the elbow . The long head of triceps brachii extends the arm (backward) in the shoulder and the forearm in the elbow . Triceps tendonitis is an inflammation of the triceps tendon tear at its insertion at the back of the elbow. It occurs due to repetitive pushing activities, such as weightlifting, throwing and push ups . Risk factors include muscle weakness, inappropriate warm up and insufficient rest between training sessions . Symptoms include pain and stiffness in the elbow and muscle weakness during pushing. Treatment includes ice packs, physiotherapy (massage) and anti-inflammatory drugs, such as ibuprofen . Recovery may last from few weeks to several months in chronic tendinitis . The tendon of the triceps brachii that is attached below and behind the elbow can rupture during weightlifting or injury. Risk factors include heavy training (bodybuilding, weightlifting, football), previous tendon surgery, steroid injections, anabolic steroids abuse, chronic kidney disease and gout (Video 2). A doctor can make the diagnosis of a triceps brachii tear by a physical examination (triceps strength test, video 3), X-ray or magnetic resonance imaging (MRI). To test your triceps brachii muscle strength, you extend the arm in the elbow against the resistance of an examiner’s arm (Video 3).